"Read the sign. 'Welcome to hell.'" Hell isn't a nice place. Heaven is a nice place. Despite the two being at odds with one another, it's wholly possible that they can work together to ensure the souls end up where they're supposed to end up. And putting them together as two different floors in a proverbial corporate high rise should be a good time. And it is in Hot Damn #1 from IDW Publishing. The issue is written by Ryan Ferrier and illustrated by Valentin Ramon. The hell in Hot Damn #1 isn't the fire and brimstone you expect; instead, Ferrier dispels that preconceived notion in exchange for a depressing city mired in bureaucracy and therapy sessions. Teddy doesn't believe he should be in hell (much like everyone's innocent in The Shawshank Redemption), yet he's forced to make the best of it by attending the aforementioned therapy sessions. Ferrier makes this version of hell a lot more cooperative with heaven as well, pitching the two opposites as really just two different teammates on the same team. In many ways, Ferrier works in aspects of heaven and hell as essentially different parts of the same corporation as a pretty refreshing take. The dialogue is very crass and befitting of those eternally damned, but Ferrier doesn't go completely overboard with it. Considering that hell in Hot Damn #1 is a lot more than raging flames, Ramon does a great job of rendering hell as a grimy and dirty metropolis of sorts. It's almost as if Ramon decided to bring together every version of a back alley and connect them in a way that defines hell. Teddy is depicted as a junkie now living hell, but what's great about how Ramon blends him into the environment is by essentially depicting what his life was like before overdosing. The panel outlines are used in a relatively fun way too, in that Ramon uses red outlines for hell, blue for heaven, white for in between and empty gutters for plane of the living. These are further embellished by Ramon's colors--a putrid green settles over hell while heaven maintains the celestial glowing blues. Hot Damn #1 is pretty laid back in its approach and it works. Teddy is condemned to hell and will suffer eternally, but it's more of a death by a thousand cuts that come with the monotony of a routine. Ferrier's characters are full of details that make you both despise and be entertained by them at the same time. Ramon's illustrations have a polluted sense to them that reinforces the notion that hell isn't a pleasant place to be. 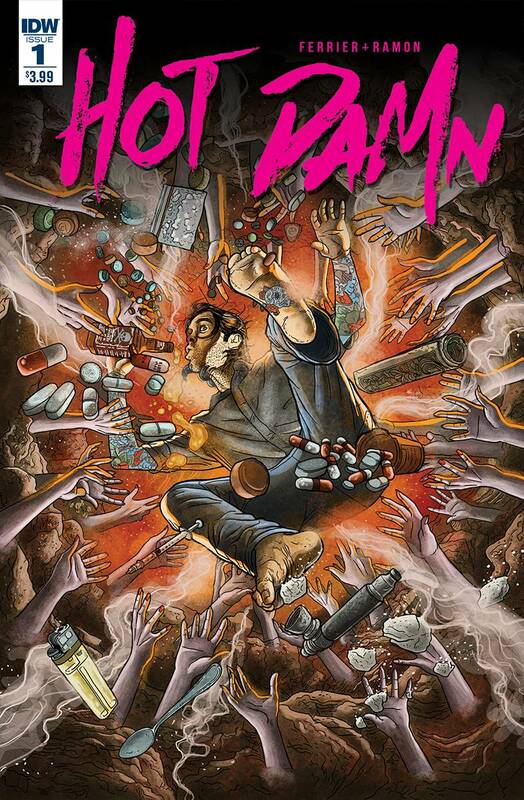 Hot Damn #1 seeks to give readers a new take on how heaven and hell interact with one another in a world that's defined by corporate trappings. Hot Damn #1 is in stores now.